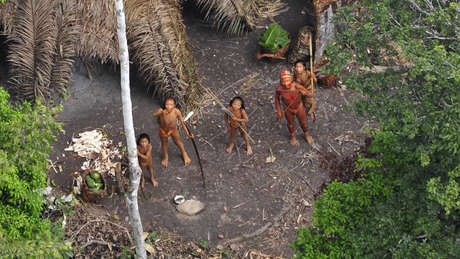 The uncontacted Indians appeared young and healthy, but reported shocking incidents of a massacre of their older relatives. Rare video footage of the first contact with a group of uncontacted Indians near the Brazil-Peru border has emerged alongside new accounts of horrific violence against their community, prompting experts to call for the urgent protection of their land or risk their “extermination” and “genocide”. The video clip was released by FUNAI, Brazil’s indigenous affairs department, and first published by “Amazonia Blog” and shows several young and healthy Indians exchanging goods such as bananas. But disturbing reports by the Indians suggest that many of their elder relatives were massacred and their houses set on fire. The uncontacted Indians are thought to have fled violence in Peru, and made contact with the settled Ashaninka community and agents of FUNAI at the end of June. The Indians were treated for an acute respiratory infection, to which they have no resistance, and kept in “quarantine” for several days before returning to the forest. After first contact, the Indians contracted an acute respiratory infection. Experts believe that FUNAI lacks the resources to avert tragedy in the future. According to experts, tragedy in the form of an epidemic was narrowly averted, but they warn that FUNAI lacks the resources and staff to respond to similar incidents in future. Guard posts in the area were closed after being ransacked by drug traffickers in 2011. The doctor who treated the Indians warned of the possibility of more contacts in the region, and emphasized the crucial need to train more specialized health teams to deal with contact and post contact situations. Peru has failed to adequately protect uncontacted Indians and their land, forcing them to flee over the border. The majority of Peru’s Amazon rainforest has been leased to oil and gas companies, which are allowed to operate in reserves dedicated to the protection of the world’s most vulnerable peoples. Survival International, the global movement for tribal peoples’ rights, has called on the Brazilian government to immediately reinstate all its monitoring posts in the area as a matter of urgency and to allocate more funding for its uncontacted Indians unit, and on the Peruvian government to investigate the reports of a massacre and protect the land of uncontacted tribes. The Inter-American Commission on Human Rights, the region’s foremost human rights body, called for the urgent protection of uncontacted tribes’ land on Wednesday. - The video footage of first contact, and accounts of the incident can be viewed here. - More than 7,000 people have signed Survival’s urgent petition for the protection of uncontacted tribes’ land.